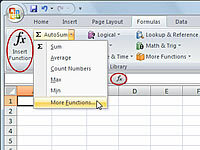 The Insert Function dialog box in Excel 2007 is designed to simplify the task of using functions in your worksheets. The dialog box not only helps you locate the proper function for the task at hand but also provides information about the arguments that the function takes. If you use the Insert Function dialog box, you don’t have to type functions directly into worksheet cells. Instead, the dialog box guides you through a (mostly) point-and-click procedure. Arguments are pieces of information that functions use to calculate and return a value. 1Display the Insert Function dialog box. The most common ways to do this are by clicking the Insert Function button on the Formulas tab or by clicking the Insert Function button on the Formula Bar (which looks like fx). 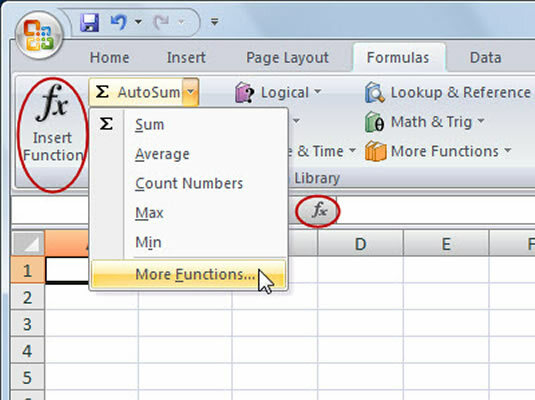 You can also access the Insert Function dialog box by clicking the small arrow at the bottom of the AutoSum button on the Formulas tab of the Ribbon and selecting More Functions. 2Select the desired function in the Select a Function list box. 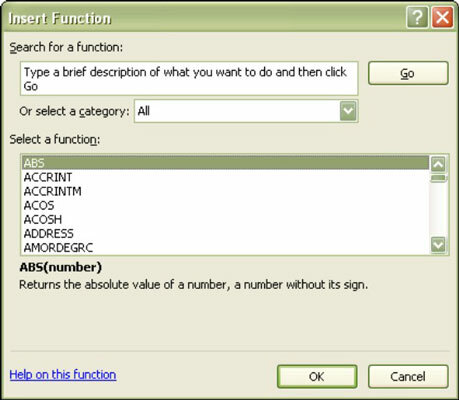 A description of the selected function, along with the function syntax, appears at the bottom of the dialog box. The Insert Function dialog box closes and the Function Arguments dialog box appears. This is where you enter or select the arguments for the function. Click the Help on This Function link at the bottom of the dialog box for more details on the function. 4Enter the function arguments and click OK.
Click Cancel if you want to return to the worksheet without entering a function.